The TypeFinder is a professional-quality personality type assessment suitable for use in counseling, coaching, and employee development applications. It has been carefully developed and researched to ensure accuracy and validity so that you can rely on it to support your professional goals. Because the TypeFinder is an online tool, we are able to conduct studies on an ongoing basis, and we are continually collecting data and user feedback to make it even more powerful. If you are interested in using the TypeFinder in your own research project, please contact us. We conducted several studies to ensure the TypeFinder is a valid instrument for assessing personality type. Our two largest studies are summarized below. We studied 3213 volunteers who reported that they were already certain of their personality type prior to taking the TypeFinder. 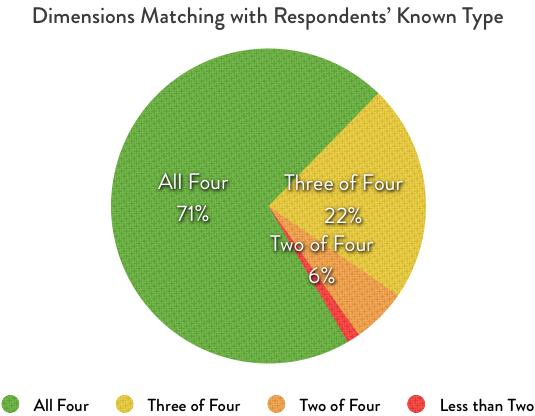 We compared the participants’ type according to their own report with the result from the TypeFinder. Seventy-one percent of the results were a perfect match with the participants’ known type. Twenty-two percent matched on three of the four dimensions. Six percent matched on two of the four dimensions. Only one percent matched on less than two dimensions. We surveyed 857 volunteers who took the TypeFinder about their perceptions of its accuracy and usefulness. 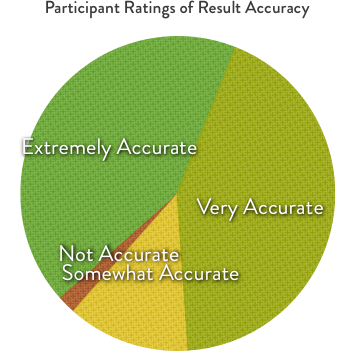 When asked “How accurate did you find your results?” over 85% of participants rated the results as either Extremely Accurate or Very Accurate. 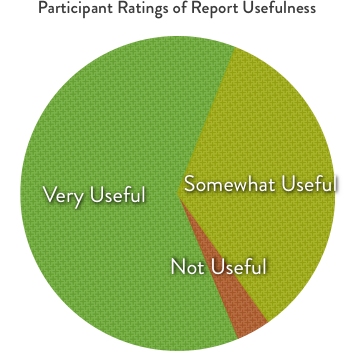 When asked, “Did your report give you useful information?” over 96% of participants said that the report was useful. The TypeFinder has been extensively researched and developed over a period of 2 years with the help of over 50,000 volunteers. The key to our development process was recruiting volunteers who already knew their personality type through taking other assessments, reading books, or otherwise doing their own research and discovery. Using this sample pool, we analyzed hundreds of potential questions to determine which were most effective in revealing personality type. Once the questions had been selected, we again analyzed the data to develop our unique adaptive scoring system. An innovative feature of the TypeFinder is that it offers more questions in areas where the respondents’ style is not clear. This allows it to be more accurate than other assessments while still being a manageable length. We conducted an analysis of the data to determine the cutoff points for this adaptive scoring and ensure that respondents were always offered enough questions to accurately assess their type. It should be noted that there are several systems that use the same four-letter type codes but are based on theoretically distinct models. For instance, some popular online type quizzes are based on the concept of Jungian functions and seek to assess the dominant function, rather than preferences on each of the four elements of type. Socionics proposes another theory which is based, in part, on physical characteristics. We consider our theoretical framework to be very similar to that developed by Isabel Briggs Myers, with a few key clarifications to reflect recent advances in personality science. Thus, our evaluations of the TypeFinder's validity are based on its ability to assess personality type as described by Briggs Myers. Results may differ when compared to personality type assessments based strictly on Jungian theory or other variations of the 16-type system.